This damask inspired floral print features a variety of colors in elegant unity. Navy or Indigo blue and seafoam green petals pop on the ivory background tones, with subtle hints of lime green, white, and peach. 12" base diameter, this style of Parchment (Paper) shade does not have a built-in tripod. 12" tripod/shade supports are available for purchase separately. This 12" Floral Multi Parchment Shade is lightweight, and works well on Aladdin shelf and mantle style lamps such as the aluminum Watchman, the Genie II, and Genie III series lamps. 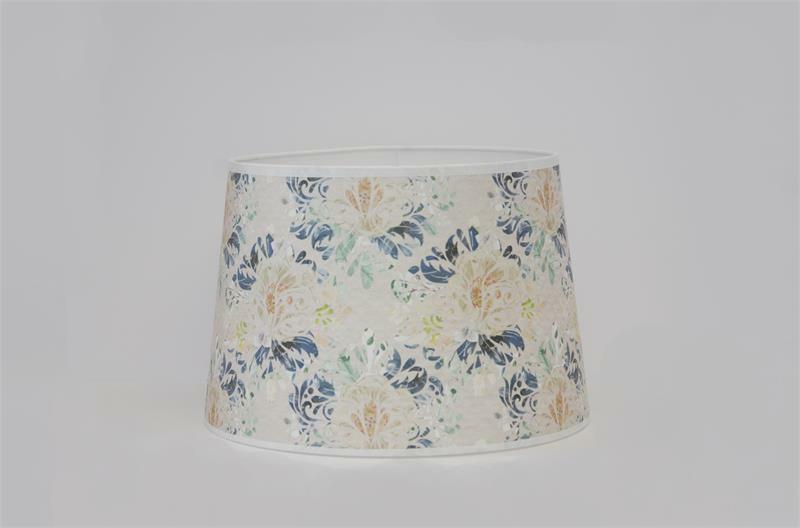 The 12" diameter paper shade would also look at home on any full size Aladdin Kerosene Mantle Lamp Table Lamp, glass or metal. Elegant black and white design. Perfect for Aladdin Genie series lamps, shelf and mantle lamps.